1981 - A classic year. Phil Collins started his solo music career, after taking over Genesis, An American Werewolf in London and The Evil Dead were released. It was also the year that I was born, and when The Exorcist was first released in the UK on VHS. 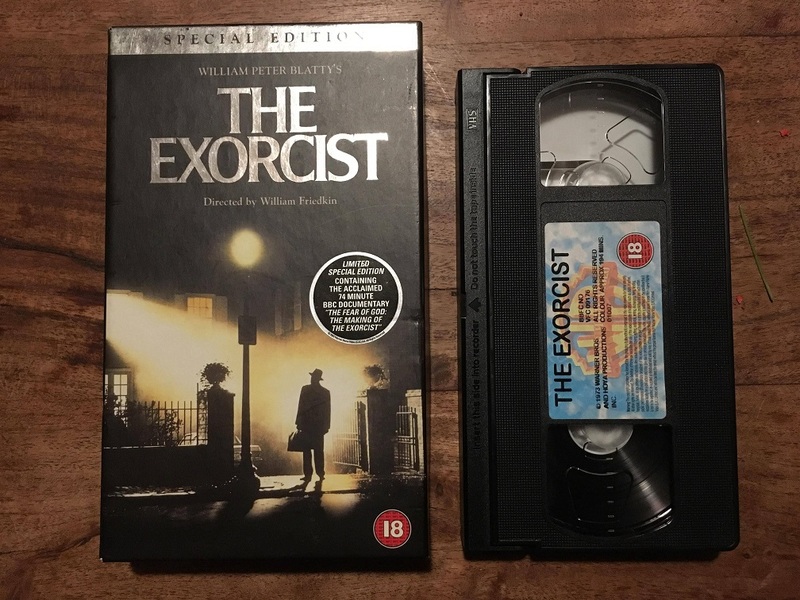 For those of you unlucky enough to not remember or even know about VHS, it was a way to watch films at home in a quality not too dissimilar to a severely scratched Blu-Ray, yet it was amazing. Seven years after release, the BBFC removed the movie from our shelves and notoriously ‘banned’ it. At the tender age of just 7 years old, I wouldn't have had a chance to see the movie but it would have been on my radar. At that age, my "Cool" uncle would rent videos for me and they always had to be Horror... it was the only genre I enjoyed at that time, even though they terrified me. I always put a brave face on things, but I certainly wasn't comfortable. As I got used to things and started appreciating horror rather than being scared by it, I tried to seek out titles I'd heard of, but not seen yet, which would push my limits and once again, scare me. Fast forward to 1998 and at 17 years of age, experiencing the theatrical re-release of The Exorcist finally became a possibility. All I needed to do was grow some facial hair and hope not to get asked for ID for the first time. This was the pinnacle, the toughest movie on the planet was finally in my sights. I would finally get to see what all the fuss was about. I sat in my comfy 90’s cinema seat and the house was packed. There was an uncomfortable edge in the air for sure. I distinctly remember questioning why was I there. Did I really want to see this? What if the rumours were true, the film is actually cursed? The BBFC rating appeared on-screen, the 18 certificate looking more red than I’d ever seen it before, and something didn’t feel right. And that right there explains my relationship with The Exorcist, something doesn’t feel right. I must explain, I do not believe in ghosts, the afterlife, and I not affiliated with any kind of religion... but there is something I can’t put my finger on that is ‘wrong’ with The Exorcist. That night, most people were laughing at what they saw on screen, it seemed to have lost its impact from the original release. A new generation exposed to Freddy Krueger, Michael Myers et al, who just seemed to be over Regan and her tale of possession. Not me, I watched in silence and loved every minute of that film. It was dark, unnerving and full of dread, a story told in a slow burning manner which exploded at the climax. I couldn’t have asked for more. It met and far exceeded all my expectations and I loved it. But then, things started to happen, and I attributed them to The Exorcist. Could a demon in the movie reel, really be punishing me for enjoying this? 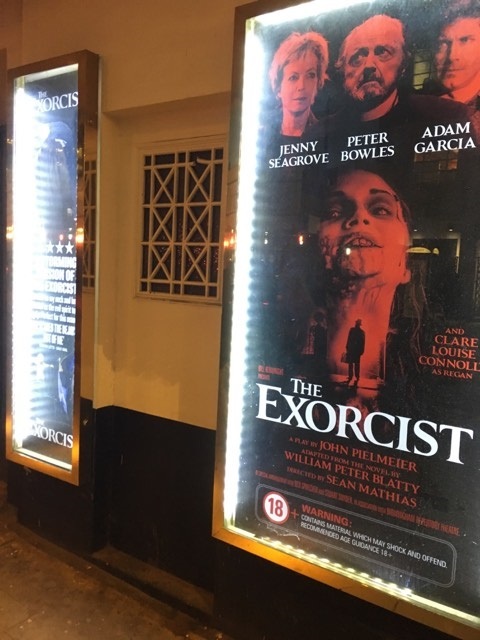 For example, as I write this, fresh on the back of seeing the West End adaptation of The Exorcist, floor boards above me creak. I’ve never heard that before, but tonight I hear it. I am upstairs in my house and it is actually the boards in the loft creaking, which of course makes everything all the worse in my over-imaginative brain. Any other night I would put it down to freezing temperatures, and the heating just been coming on, so the combination of hot air rising and cold wood has made the boards expand and creak. Tonight however, I’m being taunted by an unseen entity, punishing me yet again for witnessing another adaptation of this unholy story. 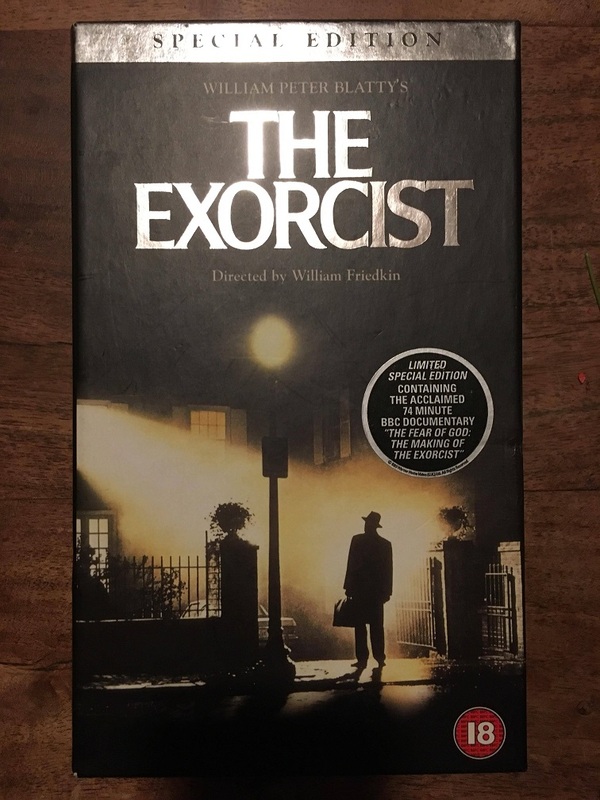 The night before the VHS release in 1998, I was riding my bike home at night and fell off, scraping layers of skin off the top of both my hands. An accident so painful I had to visit the hospital that night to get stitched back up. However, the pain didn’t stop me from leaving the house the next day to buy the video with two bandaged up hands, and a bruised ego. I took the video home and a friend and I planned to watch it that evening. Although it sounds far fetched, it is completely true that whilst watching, the moment Pazuzu appeared on screen, a very personal picture of mine fell off my shelf and landed face down. This was before smart phones and d**k pics, so take your mind out of the gutter! My friend and I were freaked out and recognised this was weird, but after discussing for 10 minutes we didn’t make much fuss about it and just carried on watching. However for me, that was it. I was done with The Exorcist. I vowed never to watch it again or even own a copy of it, I didn’t trust it. This brings us forward 18 years, to 2016. 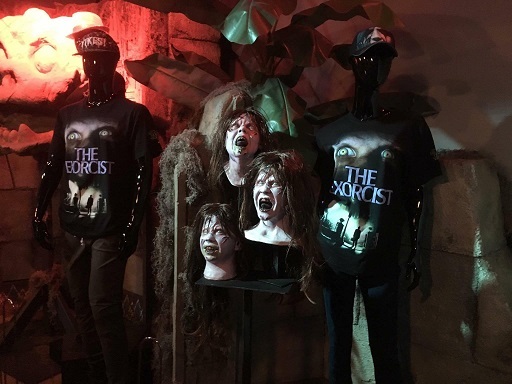 Universal Studios - Halloween Horror Nights, an event I attend every year announced that they were going to recreate the movie as one of their horror mazes in October, and I would get to walk through the iconic scenes from the movie. Great! Tradition for Halloween Horror Nights has always been to re-watch the movies I planned to walk through, before attending the event. It’s essential to do this to truly appreciate how accurate Universal’s recreations are. So, I watched the movie again, this time, an uncut recording from satellite TV. Times change. 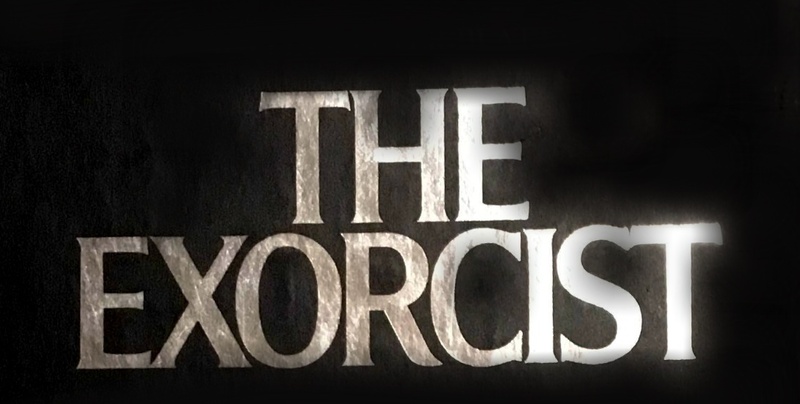 I re-watched The Exorcist, no dark incidents occurred, and so my love for the movie was re-ignited. I attend Halloween Horror Nights on both coasts of the United States, first Orlando, Florida and then Hollywood, California. Both versions were completely different to each other and both were beyond expectations. Unnerving, faithful and genuinely awe-inspiring. My other half would review it differently however, she was so unnerved with her first walk-through in Orlando, that she burst into tears and vowed never to attend a walk through again. As I’m a resourceful chap, I bought her a whisky to settle her nerves and she went again Sadly, the end result was the same. By the time we arrived in Hollywood the mazes had reduced her to a shadow of her former self, and one more run of The Exorcist was enough to tell me she'd be doing no more. A shame, but I understand because, again, there was something wrong with all of this. Which brings me to the West End adaptation of this fine story. There is something wrong with this, but unfortunately not in a fun, spooky way. Following the novel by William Peter Blatty even closer than the movie did (or so I’m told), the stage version was screaming to be made. After the success of Ghost Stories in the West End, and huge hits like Let the Right One In and The Woman in Black, horror truly can make it on stage. However it pains me to say, there is absolutely no way this show can be put anywhere close to the class of the others that I mentioned, and I would think the producers can count themselves very lucky if it actually makes it to the end of its run in March 2019. The acting is close to abysmal for the most part and the only sense of dread I felt was when I spend £15.20 on a gin and whisky during the interval. The effects were close to non-existent and the few they had relied on lazy projections, blackouts, thunder and lightning and a wig. Yes... a wig. How else were they meant to recreate the infamous head turn? Anyone who has seen Harry Potter and the Cursed Child would fall into fits of uncontrollable laughter at this attempt at special effects. I know the budget is not up to Harry Potter standards, but you really don’t need a lot of money to create atmosphere and tension. The interval served as a welcome break to gather my thoughts, and even question if I should gather my belongings, cut my losses and run. Then the realisation that I'd paid £55 per ticket to be there kicked in and I had to see it through to the end. The end. Mmmm... at the end of the play, it received a huge round of applause and the audience seemed genuinely impressed. Personally, I was expecting a polite smattering of applause for the actors sharing their craft with us, but no, there was a genuinely excited round of applause. It makes me question if I’ve missed the point or if I’m hard to please when it comes to something I love. Either way, I got next to nothing from this adaptation and nobody is more disappointed than I am. Had it been a local amateur dramatics production, I would've been satisfied, but I expect a lot more from a West End show. I hate to be harsh, but I don’t think the effects were the only problem. The cast did not engage me and I genuinely had no feelings of empathy with any of them. They were the wrong cast for the job and it felt as if they'd only taken the roles because work elsewhere had dried up. I felt no love from any of them. I’m not a harsh critic, you can’t be when you enjoy horror, but save your money on this one. Treat yourself to the 40th anniversary special edition Blu-Ray and prepare for some sleepless nights. The book, the movie, the live walk-throughs are a must. Sadly the stage show, for me at least, was a bust.